If a man says something in the forest, and the SheFlogger is not around to correct him, is he still wrong? Hmm, deep thought. Let's say the SheFlogger is around, and she is royally pissed. I know, hard to imagine, but stick with me. You need to come up with something shiny fast. Let us suggest the Cloudveil Run Don't Walk LS 1/2 zip. It's a nicely fitted piece that is sure to make up for your past transgressions, at least back through yesterday. The RDW is a mere 9oz and wicks like a svelte, perky demon. It's got reflective logos so you can see her coming in the dark, which is good because you won't hear her due to a close unflappable fit and a zipper that locks down for extreme quietude. The deep ten inch zip will help her keep her cool in the face of your monumental stupidity, and the flat seams ensure that she won't chafe her delicate skin as she plants her size six in your bony chest. Ah, the passion! There's even a little stash pocket in the back for... well, her stash, I guess. The Polartec Power Stretch is smooth, stretchy and sure to please your high-output honey. The Black Ice (formerly Ice Floe) bibs are a truly versatile piece of kit from boutique-vendor-turning-mainstream Cloudveil. Thoughtfully constructed of Schoeller Dryskin Extreme these soft shell bibs breathe well, shed weather effortlessly, and have the added advantage of not picking up snow (or pet hair) as fleece tends to. The pass-through chest pocket is handy for accessing gorp, cameras or other items while wearing a pack. There is a drop-seat for answering the call of duty, and full side-zips for easy entry and exit without removing boots. 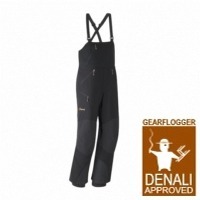 The reinforced anti-snag area fends off glancing crampon blows, and the powder cuffs make the bibs work for a wide variety of snow activities. If you've never worn bibs for cold-weather activities before these will convert you. No constricting waist belt results in a bellows effect while walking, where warm air from your nether regions is pumped up and out the top.